Corsair® a worldwide leader in high performance computer and flash memory products, today announced that the 6GB Dominator GT 2000MHz CAS 8 has passed Intel’s XMP-Ready certification for Core i7 Extreme Edition processors, making it the fastest memory kit to gain Intel’s stamp of approval. All Corsair Dominator GT modules are built using the patent-pending DHX+ (Dual-path Heat eXchange) heatsink, which uniquely cools both the front and back of the memory ICs, and the printed circuit board, for greater reliability and increased overclocking flexibility. DHX+ modules also utilize removable heatsink fins, which allows for range of Dominator GT cooling options, including the Corsair Cooling™ Hydro Series H30 waterblock and Ice Series T30 thermo-electric cooler, which actively cools the modules up to 20°C below ambient temperature for maximum overclockability. 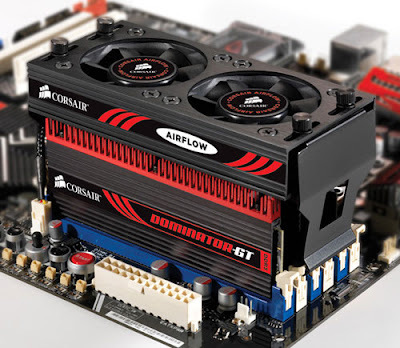 Shop Corsair Dominator GT memory for LE$$ / Full information Click here!